Search Engine Optimization (SEO) is the process of removing obstructions and layering assets to produce tangible results in a controlled fashion. Search engines (aside from their transparency) are like gatekeepers with a specific benchmark. If you exceed that benchmark/criteria, your respective indexed pages can rank very well to gain exposure and garner a higher click-through rate. The likelihood of someone venturing to page 3 or beyond to find your website is unlikely. Hence, the premise is, to have as many pages and keywords (semantic clusters) systematically wired to capture a specific type of consumer or prospect through researching search behavior to funnel them back to your most optimized page. That page, of course, is designed to deliver them to a specific conversion objective which is quantifiable with analytics. When mastered, it is one finely-tuned example of pull marketing in peak performance and sublime simplicity. In this case, the opt-in mechanism is the search engine and the search terms used to siphon a prospect to visit your website. Consider topical relevance as co-citation for a common goal. Each themed page contributes to the topics saturation ratio within your website. Once a keyword threshold is reached, the ascent occurs for the given keywords till it reaches a plateau. The key is knowing how to create and manage the conversation with search engines to build relevance across multiple phrases or semantic islands of keywords simultaneously. For a more detailed breakdown of keywords and co-occurrence, visit Dr. E. Garcia’s website for the blueprint of this formula. Though 3 years removed, I can assure you this type of technological computations are at the helm of the algorithms that shape the way search results are rendered. Forget keyword density, it is all about co-occurrence and continuity as PaIR (phrase based optimization), block segment and shingle analysis have now replaced antiquated formulas that equated word volume with relevance. Stuffing a page with keywords or building dozens or hundreds of off topic links with multiple variations will fall on deaf ears in search engines unless the semantic threshold has been communicated to the spiders that crawl your pages. Criteria such as grammar, proximity, co-occurrence and relevance score are calculated instantaneously every time a search is conducted. As a result, search engines are savvy enough to pull the right page from the data cloud and serve up the most relevant result. So, if you are still relying on metadata or content that lacks structure, don’t expect your pages to hold up against someone who truly understands real optimization. Conversion is based on identifying and catering to the mindset of that prospect through blanketing terms in the SERPs (search engine result pages) that they would use to find a website. A simple supply and demand relationship, when they search, “viola”, your website is there, the rest is systematic. One contingency that SEO’s tend to inflate is the number of competing pages. From the standpoint of difficulty or time to the top 10 for the optimization, sure this metric matters. But to a consumer, they could care less if there are 1000 or 100,000,000 competing pages, as long as what they typed in a search box finds what they are looking for. This essentially opens the floodgates since we know that semantic relationships in search engines carry a tremendous amount of weight through inherent continuity. By harnessing those relationships, it is possible to systematically devour entire semantic slices of the web (so that your pages constantly gain relevance or ascend to the top 10). If your content does not reach the given threshold to be labeled a resource, then its time to go back to the drawing board and rethink your tactic as well as make revisions and fortify your website with additional layers of supporting data (i.e. content and link popularity). Semantic root phrases with less competition fall like hollow trees when challenged from an optimized page carrying link weight or relevance in search engines. Think of it like momentum, once started, the velocity from creation time, time into the index and time it takes to start ranking and climbing all decrease with each additional page on a related topic. As an example, here is a page that was recently created in our blog. The title was deliberately skewed to capture a large cross-section of related topics, as a result (since the blog already had gained authority on various offshoots of the topic) the pages were indexed quickly and went straight into the top 10 with ease. 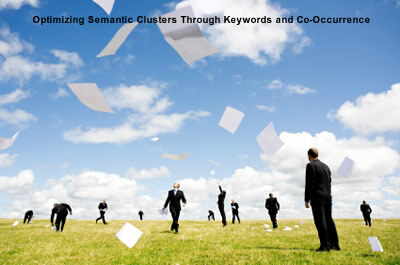 The keywords optimized for this page were: unique, search, root, keyword, phrase, so any combination entered in pairs dials in the appropriate semantic gauge that identifies our site as a vital source of information. The concept is, to perform this same feat deliberately for the keywords that have proven search volume. By understanding their threshold (competing pages, domain authority, and popularity) you can overcome them through superior relevance to the semantic root phrases from developing multiple pages or a page or website with authority on the subject. In order to implement this in any true capacity you need (1) unparalleled market research tools (2) a team for content development (3) custom plugins or optimized site structure and they know how to implement, link and promote each page to create a ranking chain reaction, or you can just poke around and hope you get a few of the criteria right. The only difference between a page that ranks for multiple keywords and one that does not organically is exposure, the support system, and reputation. If you grasp the collective points of this post, then ranking is only a matter of time supported by the right fundamental components. There is no penalty for creating content, there is no penalty for internal links, there is no penalty for creating relevant content users enjoy. Under this premise, the volume is, in fact, your ally (just use Wikipedia as an example). If you truly understand that it is possible to rank for obscure terms and popular keywords and phrases alike though focusing on co-occurrence, link flow, relevance and link popularity, then no keyword or phrase is beyond reach.